I bought my first film scanner sometime in the late 1990s, a Minolta 35mm device. I upgraded to a higher resolution Microtek sometime later, and When I started using the Hasselblad XPan, I really wanted to be able to scan complete frames, so I eventually bought a Minolta medium format model. I used this until it became unreliable and unsupported by current operating systems, and replaced it with the Plustek Opticfilm 120 which I am using today. I started using Silverfast with the Minolta medium format scanner, so I’ve been using it continuously for well over 10 years. So, all in all, I’ve built up a reasonable level of experience, and possibly even expertise, in film scanning. Apart from a few instances where I got scans for consumer film labs for quick test purposes, I have never outsourced scanning. One reason is the cost - for example, Procine in Switzerland change CHF 7.50 per frame for 120 format film (I guess this makes shooting 617 more economical…) so for a roll of 6x7 this means CHF 75. Add development and we’re practically a CHF 100, per film - scanned to 18Mb JPG (that’s pretty much $100). This is just nuts. In recent years some rather more realistic pricing has emerged from companies such as Richard Photo Lab in the US, and the quality and range of customer service seems pretty good too. However, I’m a little dubious about sending unexposed film to California. So, when I came across Carmencita Film Lab in Spain offering a similar service, I decided to give them a go. To compare, they charged me €133 including courier delivery for 4 rolls of Portra 400, scanned to (roughly) 120Mb TIFF. It’s still far from cheap, but starting to get reasonable. Carmencita Film Lab (CFL from now on) offer a range of scanning options. You can choose between Fuji Frontier and Noritsu scanners - I chose the Noritsu, as based on what I’ve read it offers a more neutral rendition with a little less baked-in contrast. I believe most people go with Fuji Frontier for Portra 400, but as long term readers here may have gathered, I’m not “most people”, and if there’s a less popular option, I’ll choose it. CFL also allow you to specify a “look”, but here I had no clue of either what I want or how to describe it (which may be a clue to the underlying reason why I’m not an Award-Winning Photographer). However after this first experiment I may now have a slightly better idea. CFL also recommend that in order to protect the film in transit you pad it with chocolate. I complied with this suggestion. I accidentally sent my films by economy post, so they took a while to arrive, but once they did, CFL kept me informed of progress, and turnaround was quite fast. A few days later I received a email with a link to download the scans, and a week or so later Fedex delivered the negatives. So, now I can compare CFL scans with my own. The four films were all shot in Calabria, in Parghelia and Pizzo, late last August. I have already published a selection of the CFL scans as a Photo Diary entry. However, the overall colour palette is still quite different. Note the colour of the leftmost door, of the green window frames, and shaded paving stones. These are complex shifts. It is possible to get somewhat closer by playing around with HSL sliders in Lightroom, and certainly in Photoshop, but that isn’t really my intention. Another possibility would be to tune the Portra 400 Negafix profile in Silverfast to a closer match, but that’s getting into rocket science territory. Another point of comparison is resolution and sharpness. The Plustek scans were done at 5300dpi with no sharpening, and then resampled to 50% in Photoshop. I’m not sure what the nominal resolution of the Noritsu is, but initially it looked a lot better. However, after dialling in some fairly heavy sharpening, the two ended up pretty well matched. At pixel-peeping levels the Noritsu appears to show a degree of luminosity noise which is not so apparent in the Plustek scans. This may actually be grain exaggerated by heavy sharpening, but in any case, in isn’t obtrusive. Again, it is relatively easy to dial out a large part of the difference with a white balance tweak, but an exact match would be tricky to deliver. I have to say that I’m pleasantly surprised by the Noritsu scans. They hold up very well against the Plustek/Silverfast combination, which itself comes out quite well against the Hasselblad X5. In fact at a first glance they are better than the Plustek output, but it is clear that the Noritsu process applies some pretty heavy sharpening, which when applied to the Plustek scans evens things out considerably. Nevertheless, from a resolution point of view, I’m not so sure that the extra time required to make my own scans is worthwhile. The colour is another matter though. Although the CFL scans are very attractive, I’m not entirely sure that they are what I want. Unfortunately, I do not have a grey card shot to compare, or indeed a reference shot on digital. I do have digital shots in Parghelia from the same days, but not really at the same time of day. I can however make some kind of rough comparison based on experience, and that tells me that the Silverfast Portra 400 profile is closer to a neutral white balance digital shot that the Noritsu. Looking at the following pair, while the Noritsu version (left) is very attractive, my feeling - which is inevitably subjective - is that the Silverfast version on the right is more accurate and closer to what I actually want. 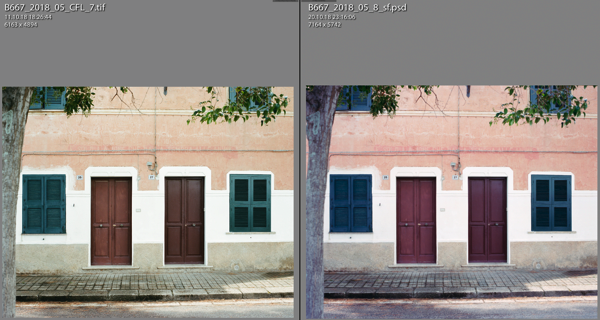 There are two factors at play here: one, the overall colour / white balance, and the second the response curve across the colour spectrum and tonal range. Let’s not forget we’re dealing with actual film here, not emulation, and the differences are due to how two different processes interpret the exposed negative film. There is a kind of “received view” of how Portra 400 is supposed to look, which has emerged over the past 3-4 years, exemplified by Johnny Patience’s published work and writings. CFL’s scans dial right into that look and do an extremely good job of delivering it. However, my reading of this look, which is reinforced by the client work that CFL publish, is that is very much driven by the wedding / portraiture market, where the combination of flattering skin tones and subdued saturation is very appealing. It can work for other genres as well, but it has to be a conscious decision. I think I will carry on with this experiment, because potentially it is very liberating. Probably I will ask for cooler shadows, although that might apply only to Portra 400, and the next film I am likely to send will be 160NS. CFL TIFFs are delivered as 8-bit sRGB, which I fell is a bit restrictive. I would much prefer 16-bit ProPhoto RGB, or at a push, Adobe RGB. But that may be technically impossible. The fact that the Plustek/Silverfast combination delivers me ProPhoto RGB at 16-bit may actually account for some of the differences, and may indicate that they are more “accurate” - whatever that means when discussion negative film. But certainly what Carmencita Film Lab deliver by default seems to be perfect for their main target market. This is an addendum to my two previous posts comparing the Plustek OpticFilm 120 to the Hasselblad Flextight X5. 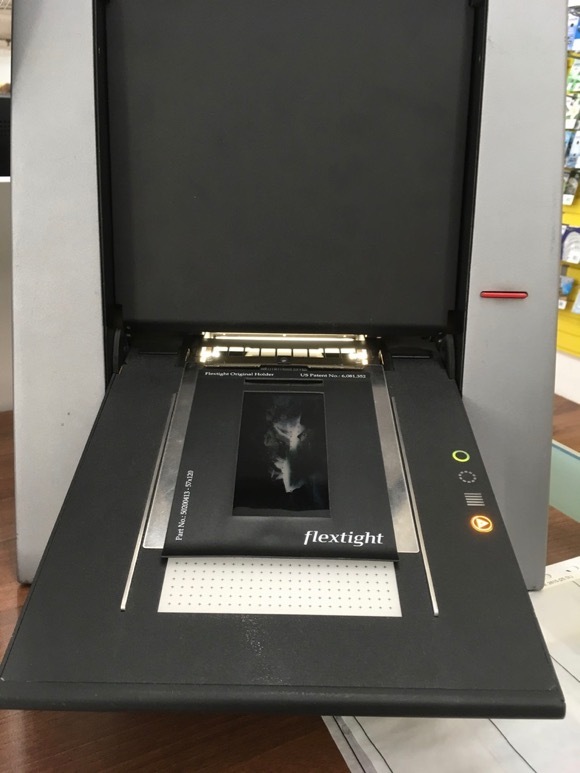 The X5 is supposed to be the nirvana of desktop scanners, a dream machine with a nightmare price tag, which provides the benefits of a drum scanner with none of the downsides, such as fluid mounting, even huger cost, and elephant-level proportions. So, what’s the X5 actually like to use ? Well, overall, it’s pretty nice. The hardware is on a completely different level. It is easy to use and very fast in operation. It scans a 6x12 frame in under a minute. But there are some drawbacks. First of all, the film holders. They’re a little weird, to be honest. The heavy rubber masks remind me of the protective shroud things you have to wear when being X-rayed! And actually they’re not that easy to use. The problem is, you lay the film on a base plate, then lower the flexible mask, which has an aperture corresponding to the frame size. But there are no guides to align the film on the baseplate, so getting it to fit correctly in the aperture is quite fiddly. Maybe with more than two hours’ experience I might realise that there is a better way to do it, but actually I find that the Plustek holders are much easier to load accurately. And them the fixed aperture size is a bit of an issue: although in theory Medium Format film has defined sizes, different cameras have slightly different film gate dimensions. So, my Bessa 667 seems to expose slightly more area in the cross-film direction, and the Linhof 612 is more like a 612.5. Actually the Plustek holders are a bit narrow in the cross-direction too, but they are fully adjustable in length. The X5 holders have no adjustment whatsoever, although I believe Hasselblad will be delighted to sell you a custom holder. Once you’re loaded, though, it’s really smooth: just slide the holder forward between the guides until the magnets latch on, and it disappears into the scanner and does its stuff. Then, there’s the software. Really, I have yet to meet a simple, straightforward and well-designed piece of scanning software, and Flexcolor is no exception. For example, if I select the 6x12 film holder, would it be unreasonable of me to expect the scan size to default to 6x12 ? Obviously it would: it took some time for me to realise that the bloody thing was producing two scans (overlapping, fortunately). Why it does this for 6x12, but not 24x65, or 6x7, will remain a mystery. Another unattractive thing about Flexcolor is that it only responds to adjustments after you let go of the respective control (slider or whatever). This makes it exceedingly annoying to use. And I still haven’t figured out exactly what it is that makes it show a full resolution rather than horribly pixelated low resolution preview - but then again, Silverfast still hasn’t figured out zooming. Flexcolor includes a fairly limited set of negative profiles, a bit like Silverfast Negafix. However, they are much less extensive, far less adjustable, and too my eyes less accurate than Silverfast, although they do produce very flattering results. I don’t think either are fully accurate (actually, the Silverfast version suffers from using Multi-Exposure, which doesn’t play nice with Negafix - the marketing material doesn’t tell you that). So, I could do better “out of the box” from the Plustek. Even as it stands, to my subjective eyes the Plustek/Silverfast version looks more like how Provia is supposed to look, The X5/Flexcolor version is almost Velvia, and too neutral. Of course, Silverfast is regularly updated. Flexcolor isn’t. On the plus side, Flexcolor coupled with the X5 can really pull out clean shadow detail to an extent I’ve never seen before from a film scanner. Of course that is limited by the exposure range of the film, so it is more useful for negatives. But still, the difference is clear. Generally Flexcolor feels old and fairly clunky, but I suppose that is because it is old. The X1 & X5 scanners are just rebadged Imacon Precision 848 and 949 models, which Hasselblad inherited when they bought / merged with Imacon to get digital back technology. They’ve carried on selling them, but they certainly haven’t tried very hard. I reckon they could drop the price by 50% and quadruple their sales, and still make a decent profit. They’re just not interested. The only update to the hardware is case redesign and a Hasselblad logo. The backplate is still branded “Flextight Precsion”. And the backplate also features a Firewire 400 interface, the one and only port, fully obsolete. At least it isn’t SCSI. The Mac Pro running the X5 at Light & Byte is running Mac OS X Snow Leopard, which must be 8 years old or something. So, is the X5 worth €25’000 ? No, unless you’ve got a business model which will subsidise it, or you work for a Swiss bank or something. Is the X1 worth €16’000, then ? I don’t think so - it loses the X5’s diffuse light source, it’s slower, and (if this matters to you) it can’t do batch scanning, or, indeed reflective scanning (which I really doubt is a major selling point of the X5, but whatever). If Hasselblad were showing some sign of continuing development, even if just to add a USB3 interface, and updating Flexcolor, then just maybe it could be considered a long term investment, but I would even be concerned that it will continue to work with current operating systems for much longer. After all, Hasselblad recently named their new pride and joy camera the “X1D”. Presumably they didn’t even remember they’ve already got an X1 in the catalogue. Last week I published the first part of my Plutek OpticFilm 120 vs Hasselblad Flextight X5 scanner bake-off. 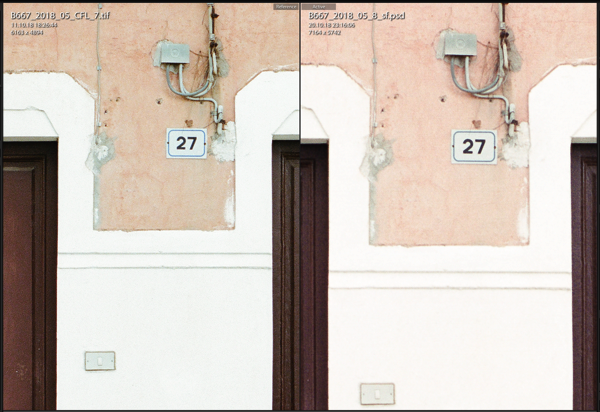 The results from scanning XPan frames were surprisingly close, with the X5 subjectively winning by a whisker. The key word in the above paragraph is “subjectively”. Because film scanning is nothing if not subjective. While preparing this second part, I once again fell down the rabbit hole of comparing output from different scanners, different software, different settings, reproducible bugs, irreproducible bugs, and indifferent customer support. I learned, or-relearned, a couple of key points about scanning, which can be summed up by saying that magic features - like “multi-exposure” - generally don’t work. It’s better to keep to the basics. That out of the way, this time around I’m going to look at two Medium Format scans, a Portra 400 negative taken with the Voigtländer Bessa III 667, and a Provia 100F positive taken with the Linhox 612. First up, the Portra shot. This was taken in a secluded spot in Venice, far from the tourist gyres. Note, you can click on any of these images to see them in larger size on Flickr. 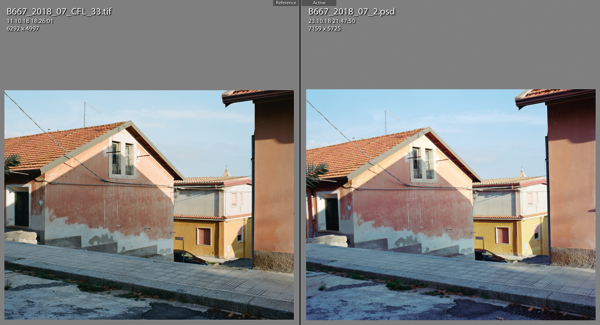 In this case I decided to apply a simple grey balance using the same reference (the letter box in the background, on the right) in Silverfast HDR for the OF120, and in FlexColor for the X5. For the OF120 I used Silverfast’s Negafix Portra 400 profile, for the X5 I used FlexColor’s Portra 400NC. As you can see, they’re pretty close. Preferences are subjective. I could show you a similar frame from my Sigma DP0, and you would see that there are differences, but if I went down that path it would never end. So, what about detail ? Well, I decided to zoom in on the notice in front of the staircase. Since the OF120 allows a scan a 5300dpi, and the X5 only at 3200dpi, the size at 1:1 is different. The extra resolution of the OF120 doesn’t really seem to add much, here. But it might be interesting to downsample to 3200dpi to get a better idea. Well, that’s interesting, isn’t it ? As we saw in the last episode, the X5 is perhaps slightly less noisy, or possibly the diffuse light source is decreasing grain contrast, but in terms of resolution it’s pretty much a dead heat. 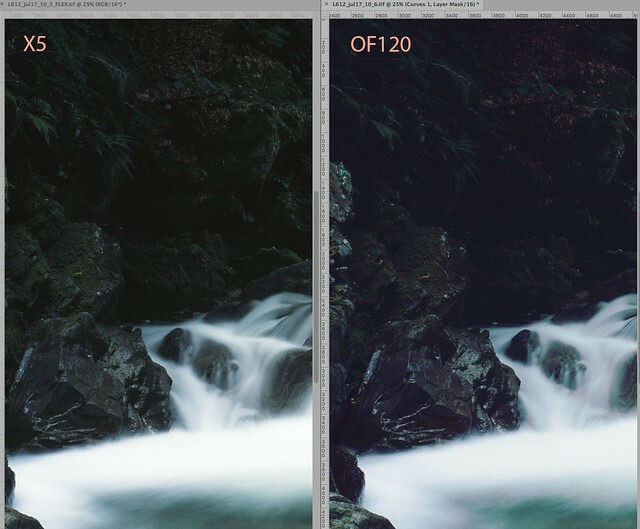 The OF120 scan is a little more contrasty, which may give the impression of more detail. On the other hand, it may really be delivering more detail. So far so good, the Plustek has nothing to be ashamed about. Let’s move on to the Provia frame. While colour negative film presents substantial challenges in colour representation, it is generally low contrast. Slide film , on the other hand, should present less problems for colour accuracy, but contrast is another matter altogether. Shadow areas can be extremely dense, and detail easily visible on a light table can be completely lost in a scan. Provia isn’t too bad in this respect, but Velvia is very tricky. It’s just as well that I don’t much care for Velvia. You can immediately see a colour difference. The X5 scan is direct from FlexColor with all settings zeroed, and sharpening off. The OF120 scan has had some magenta removed from the highlights and shadows, and contrast reduced slightly. The FlexColor scan is a remarkably accurate representation of the slide on the light table, to my eyes. The greens especially are more accurate. 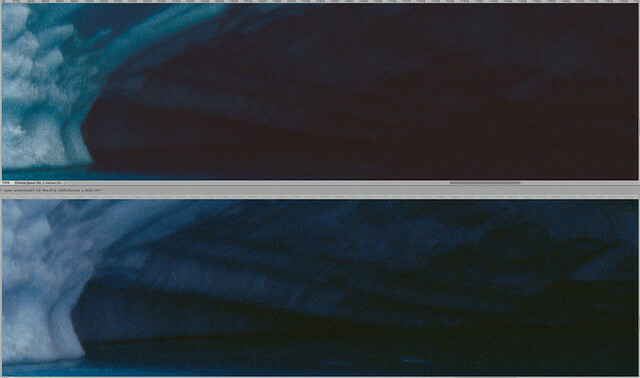 The OF120 scan seems to be lacking a certain amount of tonal separation in the higher midtones. Still, I’m not sure there’s $23’000’s worth of difference. So what about detail? Slide film is generally sharper than negative film, so this also could be more challenging. Note, however, I’m not really very familiar with the Linhof 612 yet, and I have some question if I was using an optimal aperture here. In the above illustration I have downsampled the Plustek scan to 3200dpi. Although contrast and micro-contrast might be playing a part here, I have to - just - give the prize to the X5. Looking at the tree branch, you can see a smidgeon more detail. But let’s face it, unless you make a print the size of a bus, it is totally insignificant. 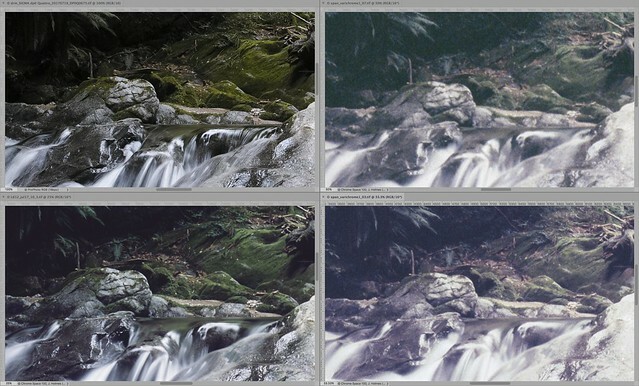 Note though, if you allow FlexColor to do post-capture sharpening, the gap widens considerably. 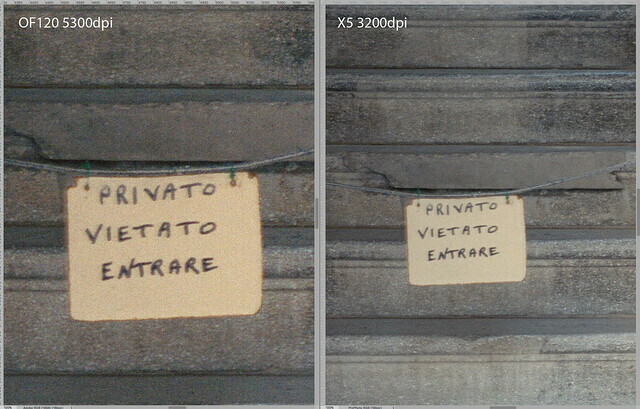 FlexColor appears to have very good sharpening algorithms, tuned to scan resolution and scan type. Silverfast’s USM on “automatic” setting is also not so bad. But nowhere as good as the FlexColor / Flextight combination. Still, there are many options for sharpening. However, there is one area where the X5 nails it. 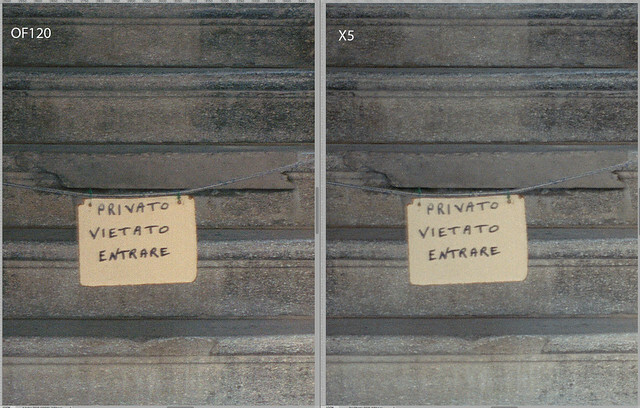 Just as we saw for the XPan slide scans, for shadow detail the X5 wins easily. 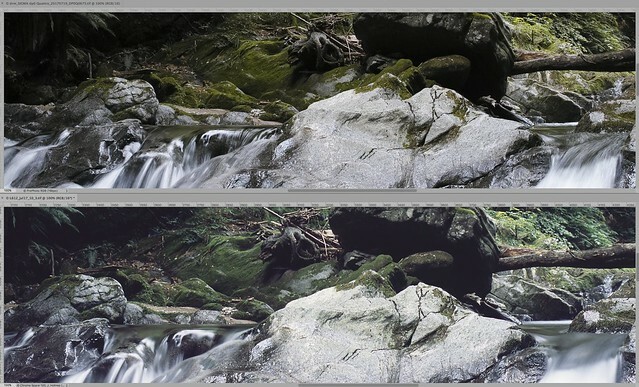 In the sample below, I haven’t even touched the shadow depth slider in FlexColor, which can widen the difference still further with significant downside. So, from this point of view, it is difficult to avoid envious glances in the direction of the X5, or at least it’s X1 sibling, which is only astronomically priced rather than absurdly. The above version was scanned on the Canoscan 9000F flatbed scanner using Silverfast Ai Studio, calibrated with the same IT8 slide as the OF120. This is straight from the scanner, with all Silverfast settings flat. The colour accuracy is quite noticeably better than the pre-adjusted OF120 version, and it appears to have more shadow depth. This is a bit scary. So what about resolution ? Well, the 9000F can’t quite keep up, but at less than 1/100th of the cost of the X5, I guess it does a reasonable job. I only really bought the 9000F some years ago because I needed a document scanner, and remarkably it came bundled with Silverfast HDR: this was easily the cheapest way to acquire that software. So really I haven’t paid that much attention to it. It just sits there and does what it’s told. I am vaguely aware that it has a reputation of being rather under-appreciated, especially compared to Epson flatbeds. These days you can pick up a 9000F MkII, sadly without Silverfast, for just $200. The film holders are truly horrible, but otherwise, it’s pretty good. So, what about the OF120 vs X5 ? Well, I think the OF120 delivers quite enough resolution. Colour accuracy is another matter. Of course, one could blame Silverfast, but I have used the latest versio of Vuescan as well and have found similar issues. And the same Silverfast delivers much better results with the Canoscan. I have made a whole series of Portra 400 scans with various combinations, which I may present as addendum, but in that case getting good colour out of the OF120/Silverfast combination proved quite a challenge. On balance I think the Of120 put up a pretty good fight against the Flextight X5, but at the same time it is not as superior to the 9000F as it should be. For scanning 35mm film I’d still go with the higher resolution of the OF120, but for medium format, honestly I’d be tempted to recommend the cheap but excellent Canoscan, or perhaps the more expensive but theoretically superior Epson V850 (which I’m tempted to try). 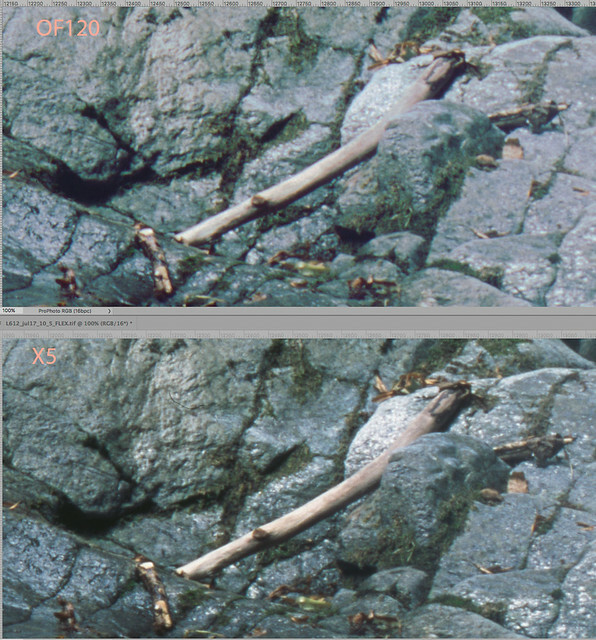 One advantage that a dedicated film scanner should have is delivering better shadow depth and tonal separation for slide film. 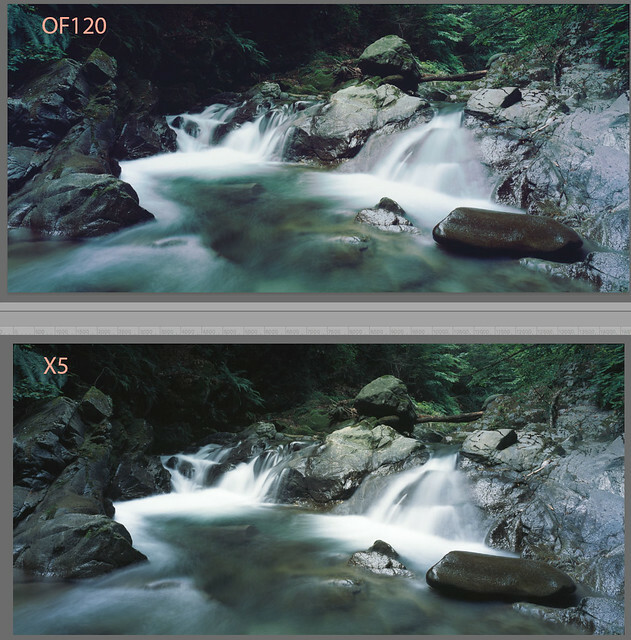 I’m not convinced that the OpticFilm 120 achieves that. As a final note, I should point out that I haven’t yet extended testing to black & white film. That brings a completely different set of issues, and may well result in very different conclusions. I don’t generally have much to do with black & white, but since I have 5 rolls of Ferrania P50 to burn through, I may have something to say on this later. Last week, I finally ended up doing something I’ve been wanting to do for years. I rented a Hasselblad Flextight X5 scanner for a few hours, at Light + Byte in Zürich. My basic objective was to find out if this scanner really is the miracle device some make it out to be, to find out how easy it is to use, and to evaluate if it would be a worthwhile investment in time and money, long term, to book regular sessions to scan my favourite shots. And, while I was at it, to benchmark my OpticFilm 120. I think this is going to be the first of several posts, because fitting it all into one is going to end up far too long. I took several examples of film with me to scan, including XPan positive, XPan Scala, Linhof 612 positive and negative, and Bessa 667 positive and negative. I managed to get through a fair few of these, but not all. In this post I’m going to concentrate on a couple of XPan Kodak E100G frames. 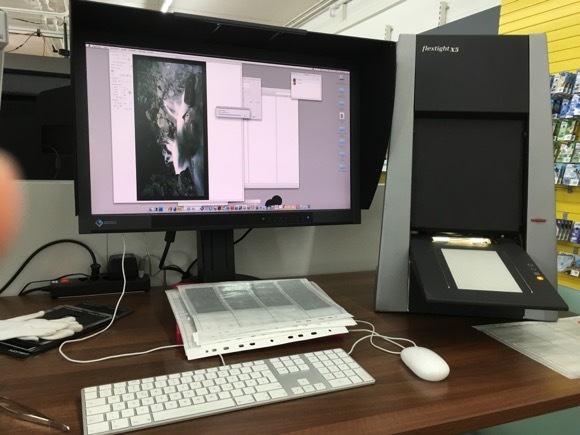 I won’t say much about user experience of the Flextight X5 here, I’ll leave that for another post, but suffice it to say, while it is impressive, like all film scanners I’ve ever used, it is not free of issues. All the Flextight scans were processed with FlexColor v4.8.13, and all OpticFilm 120 scans with current version of the Silverfast Archive Suite. My first example is a photograph taken in Antarctica in 2013. On the light table this looks fabulous, but it is an absolute nightmare to scan. The detail in the shadowy “cave” area is quite apparent on the slide, but very hard to dig into with the scanner. And the very bright snow required pushing E100G’s exposure range to the edge. I’ve tried scanning this in the past with the Minolta Multi Pro and with the Opticfilm 120, with all the various combinations of multisampling and multi exposure, but getting acceptable shadow detail has been very difficult. Obviously things like brightness and colour balance can be tweaked for ever, within the quite restricted range of flexibility. Although it would be nice to get an exact duplicate of how the slide looks on a light table (or rather, a specific light table), that’s not going to happen, for a very long list of reasons. This is just the nature of film scanning, and fighting against will only lead to frustration. But what we can hope for is to extend as far as possible the flexibility of the scanned file, to increase its tolerance to manipulation. This is where mumbo-jumbo stuff like “DMax” and “DeltaE” comes into play. I’m not going to get into that, I’m going to limit myself to subjectivity. Ok, so let’s start looking at a few details. First of all, resolution, and (much) more important, focus. The OpticFilm 120 gets very maligned for its alleged suboptimal focus. It does not have autofocus, but rather fixed focus, with a lens depth of field which is designed, so they say, to ensure that all areas of the film are within the zone of sharp focus. Actually, if you think about it, this is in theory a better plan than have auto focus on a very small area of the film with a lens with very narrow (we’re talking sub-millimetre here) depth of field. But geeks like to be in control. Of course, just because Plustek marketing tells us this works, this does not mean we have to believe it. The X5 does its own fully automated focus calibration. But anyway, lets take a look at some 1:1 zooms. Remember, the X5 is delivering 6300dpi, and OF120 “only” 5300dpi, so the sizes are a little different. Let’s also remember a minor detail: the OF120 costs around €2’000. The X5 costs around €25’000 - TWENTY FIVE THOUSAND EUROS. And the X5 has an obsolete Firewire interface, and software which has had no meaningful update in about a decade. Ok, lets take a look at shadow detail. As I said above, this has been a big challenge with this slide. Here we can see where the X5 starts to earn its keep. It is extracting a lot more usable detail in the deepest shadows, which may end being usable for a print - although it is still going to require some careful post-processing. 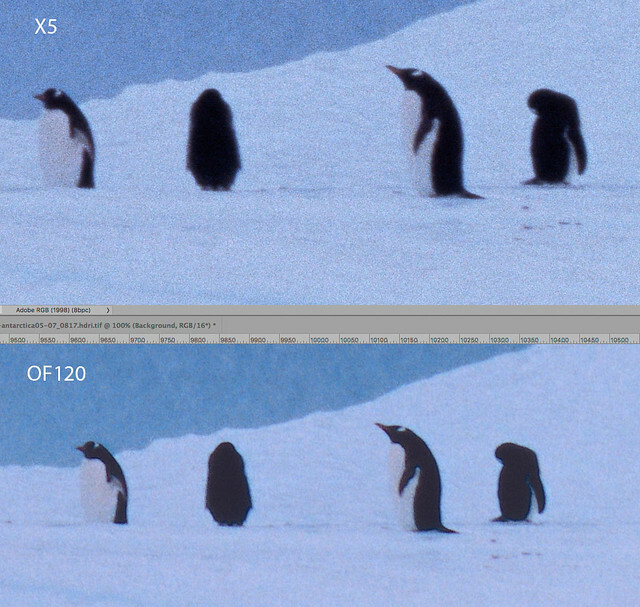 The OF120 doesn’t do too badly, but it can’t quite keep up, and any attempt to open up the shadows further just makes the image fall apart. So, for any extra €23’000, you can get a bit more shadow detail. Of course, sarcasm aside, to an exhibiting photographer selling through galleries, this can actually be worthwhile. Looking in more detail, we can see that OF120 / Silverfast combination does a pretty good job in terms of noise suppression, and that the detail is very, very nearly there - but not quite. By the way, the colour difference is a result of adding a curve on the OF120 version to try to match the highlights on the X5 version. This introduced a slight green shift in mid-blues which I need to dial out. I haven’t actually bothered here, because getting an exact match of two completely independent impressions of a physical slide - neither of which match the slide perfectly - is a fool’s errand. I repeat, accept that film scanning is a subjective activity, or accept that your head will explode. My second test case is even trickier. This is a frame with underexposed mid-tones but near blown highlights. It also has no neutral tones, and is predominately blue, which is neither scanner’s favourite channel. It was shot in very challenging conditions, doubly so for a manual focus film camera. But it is worth working on - a shot taking a few seconds earlier, with slightly different framing, is by far my post popular on social networking. Example 2 - the penguins. This version is from the X5, but required quite some manipulation in FlexColor. It’s quite close to the original. Zooming in on the stars of the show, once again in terms of real detail and focus there isn’t much to separate the two versions. The grain is a bit smoother on the X5 version, and to be honest the initial colour out of FlexColor (not shown here) is probably better than that out of Silverfast HDR. However I’m working from a very small sample here, and with intentionally challenging slides. I’m not sure if the difference is worth €23’000. You may have noticed that I haven’t mentioned that there is a cheaper less eye-waveringly expensive version of the X5 called the X1. I haven’t tried it. It offers less resolution than the X5, and probably more significantly, does not include the X5’s diffuse light source. It costs around €16’000. So, based on what I can see here, for scanning XPan film, the Plustek OpticFilm 120 is comparatively a real bargain - albeit itself not cheap. 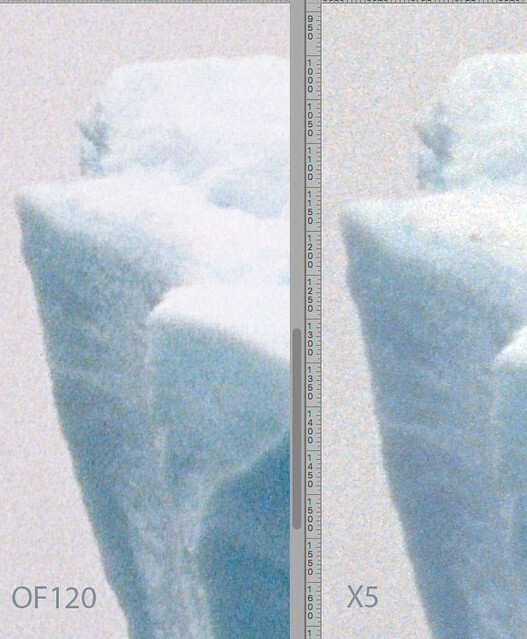 The Hasselblad Flextight X5 returns higher resolution scans, but with two examples here, it seems that the OpticFilm 120 already outresolves the film-lens combination. And XPan lenses are very sharp. Possibly using some ultra-high resolution, ultra-low ISO monochrome file, Adox something or the other, we might see an advantage to the X5, but that film has very little practical use for me anyway. The X5 can also extract more deep shadow detail from slide film, which could be useful now and then. So, technically, a win here for the Flextight X5, but I’d say the OpticFilm 120 is the moral victor. That’s all for now - following posts will look at medium format scans, and describe what it is like to work with the Flextight. Having now added a Linhof 612 to my arsenal of wide-screen photographic tools, the time has come for a showdown. Which, if any, is the best? Now, you may say that I could substitute any digital camera for the dp0, and “just crop”. Well, you could, but I can’t, because accurate composition through the viewfinder is important to me. 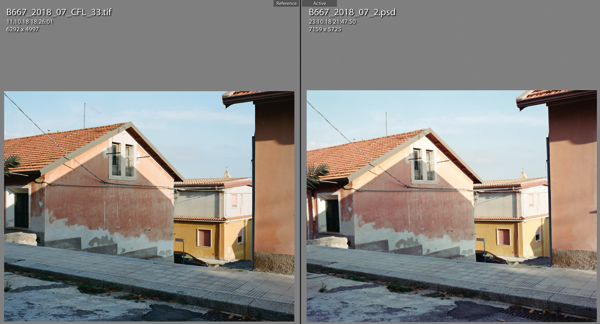 The dp0 comes close to the XPan with its wider lenses, but as far as I know all Sigma Quattro cameras, so dp0, dp1, dp2, dp3, sd and sd-H offer a 21:9 crop. I don’t know of any other cameras which do. I’ve compared the dp0 with the XPan in the past, and concluded that the Sigma is certainly a valid contender for the title of “digital XPan”. Indeed, it replaced the XPan in my camera bag on my last trips to Iceland and Antarctica. But the Linhof, surely, with its huge frame size, should come out of top ? For the film cameras of course we have another factor in the equation: the scanner. I’m pretty sure that the OpticFilm 120 at 5300dpi extracts at least 90% of the potential resolution from the exposed film, but I’m not fully convinced that it reaches 100%. Possibly a drum scanner or a Hasselblad Flextight could do marginally better, but if it takes a €15000+ scanner to outdo a €900 Sigma camera, then we’d be be getting into the realms of insanity. Of course, the relative file sizes are a bit scary. But I’ve got lots of disk space. 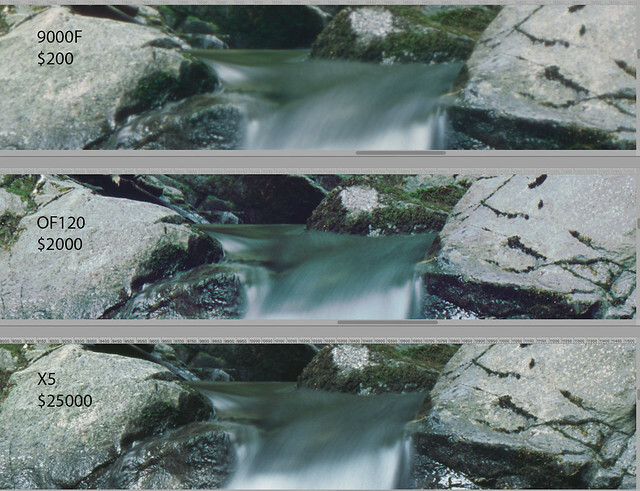 For the test, I trudged up (and down) to a local valley stream, set up the tripod, and shot frames from each camera. The scene was initially framed using the Linhof. The Linhof was loaded with Fuji Provia 100F, and had the 65mm lens mounted. The XPan, sadly, was loaded with Rollei Variochrome, set at ISO 200, in a parallel test described previously. I shot XPan frames with both the 45mm and 30mm lenses. The Sigma of course had its fixed 14mm lens, which is roughly equivalent to 21mm for so-called “full frame”. I was interested in two aspects: the different frame coverage, and the comparative resolution of each system. Colour was not really relevant in this particular exercise, although the differences are interesting. But anyway I haven’t even attempted to try to match colour. So, here are the “results”. First, the comparative frame coverage. Clockwise from top left: Sigma dp0, Linhof 612 65mm, XPan 45mm, XPan 30mm. It’s difficult, but please ignore the horrendous colour of the XPan frames. The scans are all “flat” from Silverfast - I have not attempted any kind of colour correction. The first thing that jumps out for me is how close the Sigma and Linhof are. I could get even closer by shooting a 2:3 frame on the Sigma and cropping it. The Linhof is just a touch wider. The XPan 30mm is the widest of all, and its vertical coverage is very similar to the Linhof. The XPan 45mm, in this company, and for this scene, is a bit neither here nor there. Note, any attempt at choosing a “favourite” shot here is rather pointless. As I said above, the shot was framed for the Linhof, with the tripod remaining fixed for the other three, so I would expect (and indeed hope) to prefer the Linhof composition. Working with the Linhof over the past month or so has confirmed my attachment to the (almost) 2:1 ratio. The Sigma ratio is actually closer than I expected, because the actual size of the exposed film on the Linhof is 12 x 5.5, so somewhat wider than a nominal 2:1. The Linhof has just one trick up its sleeve, but its a good one: the 8mm shift is hugely useful for this kind of shot. Note the difference between the Linhof and XPan 30mm frames: thanks to the shift (negative in this case), I’m able to put the extra vertical coverage to better use, without tilting up or down and hence distorting the perspective. This limitation has always frustrated me with the XPan. Now for resolution. Remember, with the Sigma, it being a digital camera with a Foveon 3 layer sensor, we can magnify up to 100% and expect sharp results. With the film cameras it is way more complicated. We need to factor in focussing (hyperfocal in this case), film flatness, film curl when scanning, scanner lens quality, scanner depth of field, and all the general characteristics of an analog to digital conversion. Suffice it to say, film looks best on the light table, and goes downhill from then onwards. All we can do is damage limitation. In terms of numeric resolution, the Linhof clearly wins, but the level of actual information is debatable. There has been no sharpening applied here, so for the film shots what you see is what you get out of the scanner. What does appear to be the case is that the XPan lenses are actually sharper than the Schneider 65mm lens on the Linhof. One thing I’m finding with the Linhof is that objects at infinity seem to be quite soft, regardless of the focussing. I have no idea why this should be, but since focussing is by scale only, it isn’t straightforward to verify. Again, there are a lot of variables in the system. 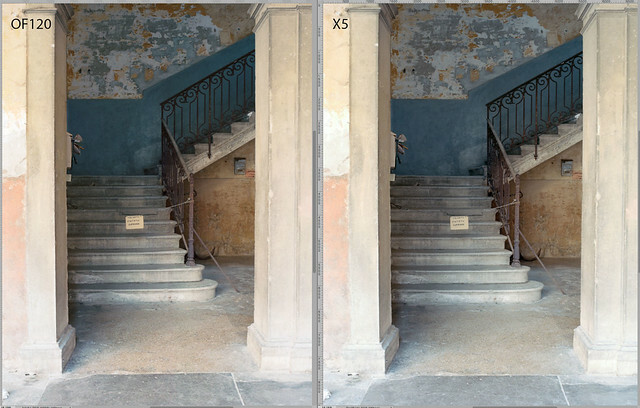 Another way to compare is to try to adjust zoom to get roughly the same field of view, as follows. Since the Sigma has the lowest nominal resolution, it defines the baseline. Now there’s not so much in it. The XPan with 45mm trails slightly, at least in this example, but otherwise the level of detail is close. 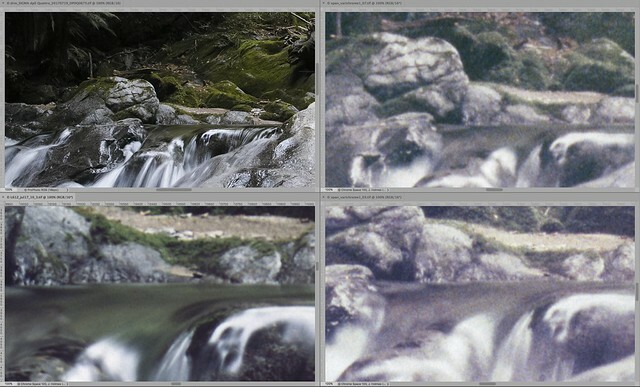 Probably if the XPan had been loaded with Provia 100F then the difference would be smaller. With the Sigma there is a higher level of micro-contrast and acuity, but appropriate processing of the film images can close the gap. Note, when printing these images at the maximum size I can achieve on my A2 printer, in all cases there is quite sufficient resolution, so this exercise in pixel peeping should be taken with several grains of salt. However, the clear conclusion is so far that the Sigma dp0, which is more practical, lighter, considerably less expensive and offers immediate feedback, is pretty much a match for either of the film cameras on a technical level. To be honest it is probably the best of the three, in purely technical terms, and in the right conditions. 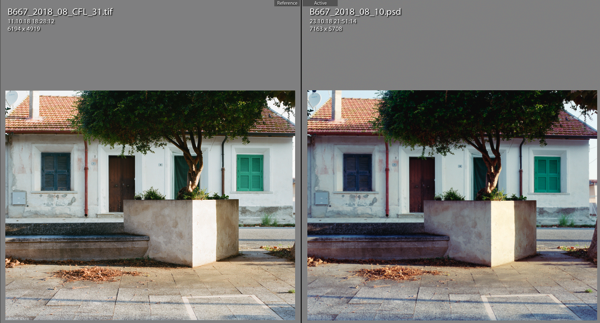 The Sigma definitely seems to give slightly more real resolution, although there is a hint of some variation across the frame from the Linhof. But in the best case scenario, the Linhof / Plustek OpticFilm 120 combination is a match for the Sigma dp0 in terms of effective resolution - no more. So why use the Linhof, and why use film at all? Well, all is not rosy in the Sigma world. Although it is not too apparent in this frame, it transitions to over-exposures in a very harsh and unpleasant way. 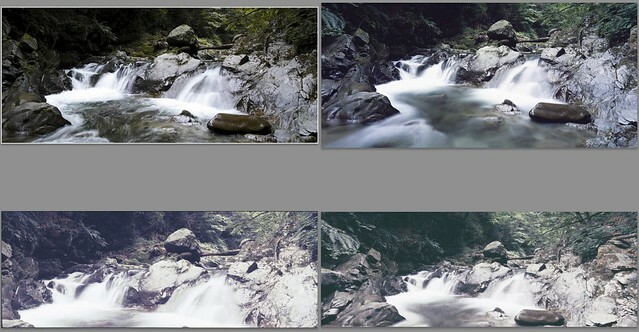 With scenes featuring flowing water, for example, you need to be extremely careful with exposure. And since the Sigma’s output is nowhere near as malleable as that of almost all other modern digital cameras, you have to very careful indeed. Actually it is this poor handling of highlights which makes more hesitate about investing in the Sigma sd Quattro system. Of course, you also have to be careful with slide film, but even slide film with its aversion to highlight overexposure handles transition to burn-out much more naturally. The Linhof also features one of the absolute best viewfinders ever made. If in-the-field composition is important to you, as opposed to fix-it-in-Photoshop, then this is a big deal. And finally, the killer feature, the “permanent shift” lens, which avoids the Achilles’ Heel of panoramic photography, vertical entering of compositions. And what about the poor old XPan? Well, it too has its advantages. First, the 30mm lens gives a wider field of view than either of the other two (although a Linhof 612PCII with 58mm lens would be wider). The XPan also has a rangefinder, making manual focus very simple, and very reliable auto exposure. And it is a quarter of the size of the Linhof 612. I’ve been using it for 17 years, and it’s not for sale. Yet. And finally colour - although I like the colour output of the Sigma, it can be a little weird. 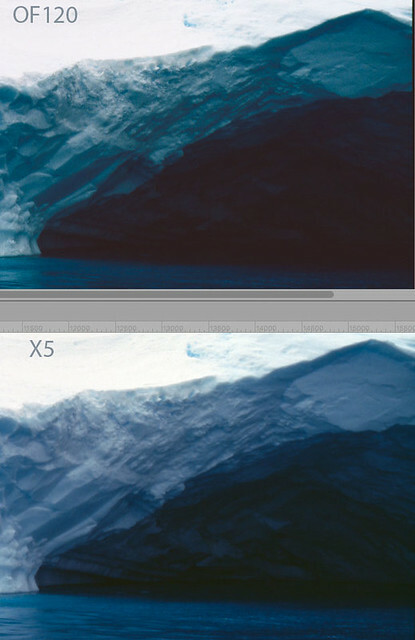 Actually in the example here I used a custom colour profile in Lightroom. The rendition of Provia 100F, once the blue shadow cast is removed, is to my eyes more natural. There is also something ever so slightly sterile about the Sigma output. But finally, all three are great cameras which give me a lot of satisfaction. If I was pushed to produce something on a tight deadline, if the subject permitted it I’d probably use the Sigma. If I wanted the best control of composition I’d use the Linhof, with Provia 100F for landscape or Portrait 400 for urban work. For maximum flexibility and discretion, the XPan. In all three cases, I’d be able to print as large as I am able to with no compromises. How sharp is your scan ? See all entries in "Scanning"